Thanks to a grant from The Esmée Fairbairn Collections Fund, Leeds has for the first time been able to fully catalogue The Cotman Collection and Kitson Archive and publish it on this website. 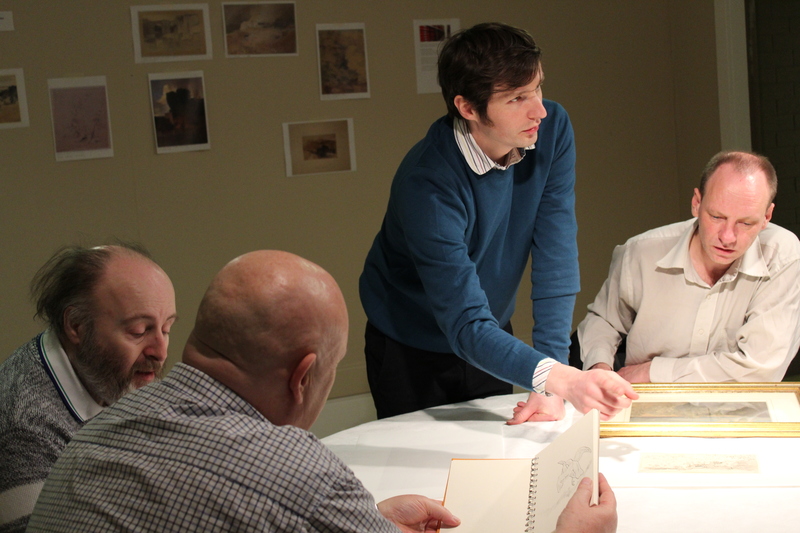 To support this three year long research project we ran a series of community, learning and artist-in-residence programmes that have help radically transform our understanding of Cotman's work. Here is just a small selection of these projects that we hope might inspire you to revisit the work of John Sell Cotman (1782 - 1842) and this nationally important collection. Photograph: the exhibition 'Shelter from the Storm: John Sell Cotman', October 2017. 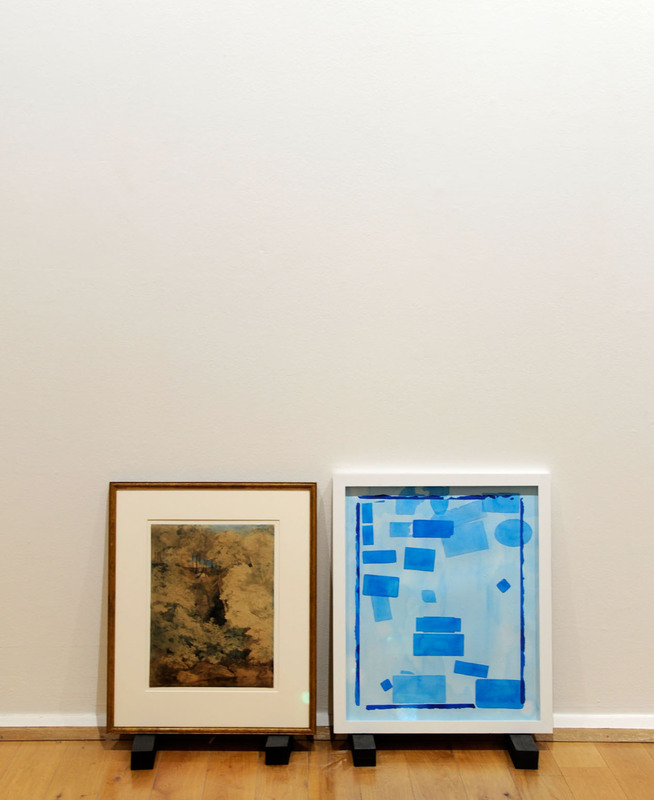 Through the independant support of The Esmée Fairbairn Collections Fund and Arts Council England artist-in-residence Hondartza Fraga created a series of new works in response to The Cotman Collection and Kitson Archive. Fascinated by the relationship between original objects and the tools used by museums to care for them Fraga has created a new body of work seeking to reveal and make visible the hidden workings of both the archive and the collection. Fraga worked in watercolour after Cotman and chose blue after Kitson who bound his Cotmania notebooks in a greyish blue to echo Cotman’s use of the colour. Her animations and watercolours offer a contemporary response to the work of John Sell Cotman and a homage to Sydney Decimus Kitson’s ‘Cotmania’. In her own words Fraga sought to create ‘a visual eulogy to the archival process itself, its instruments and also its melancholy’. Kitson’s notebooks are particularly poignant. They trace his unfailing dedication to the study of Cotman. The last volume is incomplete, disrupted by his death, and remains bound in red. The works Spines I, II and Covers closely follow the form of Kitson’s notebooks, directing our gaze not to their contents but to their character. 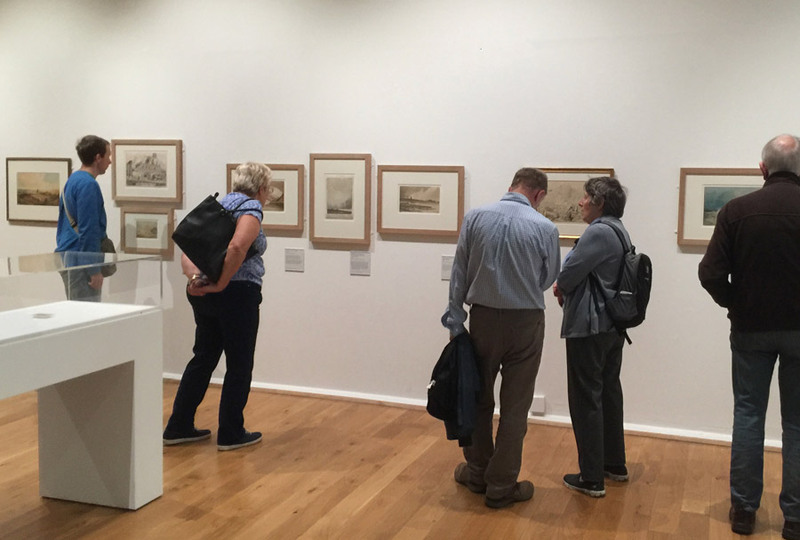 Fraga's watercolour Exhibition History is based on Cotman's Greta Woods, which was regarded as one of Cotman’s most important works, following its inclusion in his 1922 exhibition at the Tate. The back of the frame is covered with labels that reveal a rich history of past exhibitions, owners and auction sales. Fraga has used the forms and arrangement of these labels to inform this watercolour. For more information about Hondartza Fraga visit http://www.hondartzafraga.com/. Cotman became member of a drawing club initiated by Thomas Girtin (1775 - 1802) in 1799 for artists interested in watercolour landscapes. Known as The Drawing (or The Sketching) Society, it was a gathering hosted in turns by the members, with the host choosing the group’s poetical inspiration and being allowed to keep all works made on that night. The host for the evening provided all materials and dinner. On the 20th of May 2017 (marking the 218th anniversary of the first ever gathering), the Leeds based artist Hondartza Fraga hosted a one-off event to commemorate the society. The event took place at Patrick Studios, East Street Arts and mostly followed the original rules except for some notable changes applied by Fraga: namely that all the artists involved were women, the texts selected were by female authors. The artists were asked to respond to three texts, an excerpt from Frankenstein by Mary Shelley (contemporary of Cotman), the poem Boats in the Bay by Winifred Holtby (contemporary of Kitson) and the poem Workington – Beach by contemporary poet Harriet Tarlo. Each artist responded to one or more of the texts and one work by each artist is included here. The artists invited were Louise Atkinson, Katy Devine, Cheryl Huntbach, Natalie Searle, Judith Tucker and Valerie Zwart. As part of the large-scale John Sell Cotman project that re-introduced the works of this often overlooked artist, Project Curator Theodore Wilkins and Community Curator Natalie Walton took watercolour paintings from The Cotman Collection out to two community arts organisations to kick start a process of artistic responses to the work. We did not expect at that time that the interest in Cotman's paintings would lead to such an investigation into his techniques, an enthusiasm for his work and the production of such a magnificent new body of work by participants. 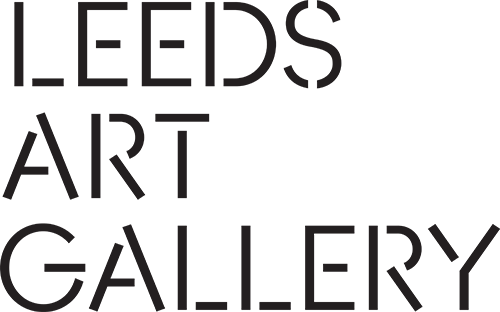 Artlink is a community arts organisation specialising in arts and health initiatives. Artlink chose to work with their regular artists group Studio 3 on this project to offer the group an intense experience of working with one artist as inspiration and the whole process of working with the gallery to; explore the collection, make responses and develop an intervention into the Cotman exhibition at Leeds Art Gallery. From March to October 2017 Studio 3 artists made practical studies of Cotman’s techniques, extensively researching and resourcing materials as close to those available to Cotman. They tried out wet-on-dry watercolour, studied the geometric and negative shapes in Cotman’s compositions, then moving on to watercolour to develop their own ideas and interpretations. 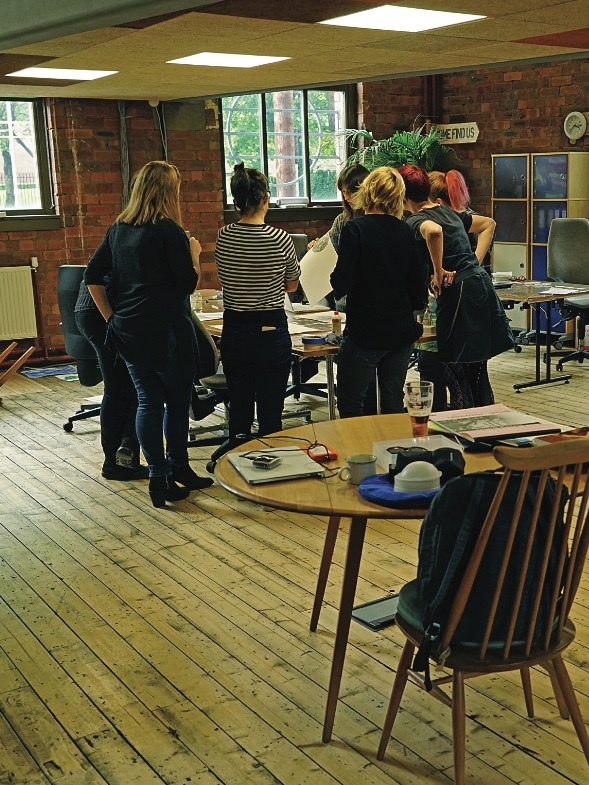 As Studio 3 grew in confidence, they began to experiment with a range of media including pencil, pen drawing, water-soluble pencil, ink sticks, silk painting, photography, acrylics, oils, emulsion paint, animation and book binding. As Studio 3 grew in confidence, they began to experiment with a range of media including pencil, pen drawing, water-soluble pencil, ink sticks, silk painting, photography, acrylics, oils, emulsion paint, animation and book binding. Studio 3 also took a trip to Knaresborough to work out in the filed in the same way Cotman and other artists would have done during their artistic pilgrimages to Yorkshire. In October 2017 artists from Studio 3 worked in the gallery space with curator Theodore Wilkins to curate their work as in intervention into the Cotman exhibition. The works were then shown in the gallery in November as well as online as part of the interpretation of the exhibition. For more information about Artlink West Yorkshire visit http://artlinkwestyorks.org. Based in Chapel Allerton, Leeds, Inkwell Arts provides an extensive programme of creative workshops that support people of all ability and background towards recovery from mental health issues. 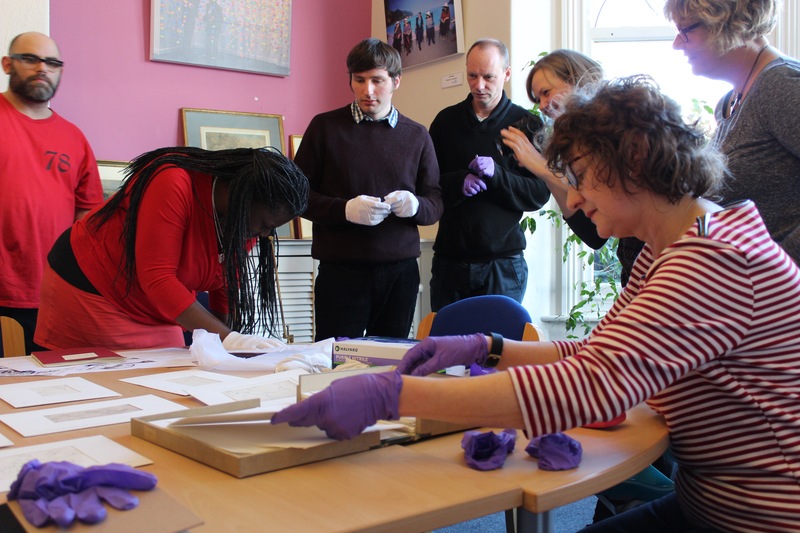 As part of the Cotman project participants were introduced to the work of John Sell Cotman through a series of workshops including brining works from the collection out to Chapel Allerton, etching workshops, exploration of watercolour and a visit to Kirkstall Abbey. Led by Leeds based artist Kevin Hickson, participants learnt about Cotman’s struggles with mental health, his financial and personal issues as well as his artistic techniques. Participants from Inkwell found it particularly poignant that Cotman struggled in his career with mental health issues and could relate to Cotman's experiences. Participants also found it inspiring to see the volume and quality of his work. Inspired by Cotman's interest in the structural beauty and landscape Inkwell Arts participants created their own, unique works, often visiting the same stunning destinations that Cotman himself found comfort in painting and drawing. This project culminated with a fully immersive digital experience at the acclaimed ‘Light Night’ in Leeds city centre, with the installation fully illuminated for one night only on Friday 6th October 2017. Exhibited in the esteemed Leeds Central Library, a main installation in Room 700 the installation was an intriguing focus for the Light Night explorers. Further works from the group have been displayed were on display in Leeds Library until October 20th 2017 and at Inkwell. For more information about Inkwell Arts visit http://www.inkwellarts.org.uk/about-us/. Text: Natalie Walton. Film: Nicholas Singleton.